A replacement banknote is a banknote that is printed to replace a faulty one and is used as a control mechanism for governments or monetary authorities to know the exact number of banknotes being printed. As quality control finds defective notes in the printing process after the serial number has been overprinted, they are taken out with their serial number written down before they are destroted and replaced with another banknote printed specifically for this purpose, so that the amount of banknote being printed stays the same in each production batch. This saves time and money compared to re-printing exactly the same serial number that was used before. Often these replacement notes are marked by special serial numbers or other markings. Malaysian replacement banknote can be identified with the prefix's first character. Replacement banknotes carry a prefix start with Z and followed by another character. RM1 Third Series is the first to have three characters for its replacement note's prefix. RM 10 features Malaysia's lush tropical jungle, which is one of the world's oldest living rainforest, is home to a spectacular variety of flowering plants. Most iconic amongst them is the Rafflesia, the world's largest flower. 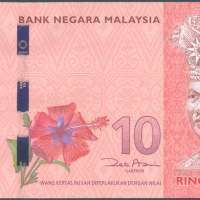 The Rafflesia azlanii species featured on the new RM10 banknote is indigenous to Peninsular Malaysia and was first discovered in the Royal Belum Forest Reserve of the state of Perak in 2003. To commemorate its discovery, this majestic flower was named after the Sultan of Perak, Sultan Azlan Muhibbuddin Shah ibni Almarhum Sultan Yusuff Izzuddin Shah Ghafarullahu-Lah. Why is Bank Negara Malaysia introducing the fourth series of Malaysian banknotes? The introduction of the new series of banknotes is to incorporate modern security features and latest advancements in technology to enhance the usage and security. The new series will gradually replace the existing series that has been in circulation for more than 10 years. What are the security features incorporated in the fourth series of Malaysian banknotes? The fourth banknotes series of Malaysian banknotes incorporate enhanced security features and retain some of the existing security features. The new security features for the fourth Malaysian banknotes series are Pixel Watermark portrait with highlight numeral, Micro lens thread and iridescent patch. Whilst the existing security features are Shadow image, Clear window, colour shifting Security thread, Perfect see-through registration, Intaglio printing, invisible fluorescent elements and micro printing.